I was 17 starting fall semester at Cal Poly San Luis Obispo, a quaint golden-hilled town in central California. For my first few weeks in the dorms, I had a bovine alarm clock, i.e., mooing cows that decided to test their vocal chords several yards from my window. It felt like, for my citified self, the romantic epitome of the bucolic. My cousin, the sort we pick up through marriage and divorce, lived in the area and offered backbreaking work, which sated my Emersonian philosophies as much as my penurious situation. On my first day working with him, he loaned me Van Morrison's Astral Weeks concomitant with perfunctory life-changing comments and soulful statements. Words I would later term as "neo-hippie power". I distinctly remember taking it home and leaving it next to my stereo. Its strange acid-laced cover probably sat there for a week, collecting dust, listening in on my in-depth mumbles on Botany and dorm hall trysts. There was a reason for my reluctance: "Brown-Eyed Girl". Van Morrison's doting love song, replete with poppy "tra-la-la-las", had tempered any enthusiasm I could initially muster for the album. I didn't want to hear sappy dross, certainly not while I meddled in such a, so I thought, highfalutin' state of academic bliss. But then for some reason, maybe the cheap Rossi I drank one night from a coffee mug, maybe because I didn't want my cousin to call and it to come up in conversation, I put on Astral Weeks. I was mesmerized. It was absolutely brilliant in a sparkling, shimmering way. Yet, I would learn that its poetic obscurity and antiphonal jazz instrumentation had its own story, engendering the album with a profundity beyond what I gleamed upon listening. By 1968, America had entered an inebriated bar brawl with its self. A sort of ego versus alter-ego clash of Godzilla proportions. Most historians make references to civil war when discussing the period, often limning how close the country came to entirely eroding the center until it wouldn't hold any more, as William Butler Yeats may have metaphorically contended. How chaotic everything became, like any retrospective glance, is fraught with left/right contentions and subjectivity. But the facts are there: the assassinations of Dr. Martin Luther King Jr. and Robert Kennedy, Walter Cronkite's critical evaluation of the Tet Offensive, the Yippie Movement, one hundred protestors in Chicago are cudgeled (another 175 arrested) by police, Nixon is elected president. A period of time Lester Bangs immortally called "one of the darkest periods I have ever experienced." Astral Weeks arrived in such a climate, with the American youth mired in bleakness and animosity. The emotions Morrison conjures forth on attachment and loss offered a portal for the searching souls of 1968. Lyrically its eight lengthy tracks are thematically linked by reminiscence. As if turning back to a more genuine epoch would illuminate a more inspiring path. The opening lines "If I ventured in the slipstream, between the viaducts of your dream" reflect on moving away from reality to a place more steadfastly understanding and loving. Tracks like "Cyprus Avenue", "Madame George", and "Ballerina" are fauvist brushstrokes culled from Van Morrison's past. These are luminous places and people that serve to realize the humanism underscoring all experience. Revealing a moment, arguably a hiding place, of innocence to a culture slowly being destroyed by mounting political tensions. Probably more noticeable to American listeners who purchased it, these were an Irish echo of Bob Dylan's outpourings on personal emptiness and societal misgivings. "Girl from the North Country" and "Ballerina" could be described as lyrical siblings. And throughout the album, you can place both artists side by side. Their potent poetics, marked by obscure references and inspired lyrical contortions, were drawn from the same well. However with one noticeable difference: Morrison wasn't the truculent, dour Dylan nor the bellicose at times boyishly satirical Dylan. Morrison came across, a product of his ostensibly otherworldly lyrics, with sensitivity as well as poignancy. Rage (or outrage) simply was not a component of Morrison's insights. The arrangements, marked by strong interplay melding jazz philosophies and Celtic folk textures, completed Morrison's Astral Weeks earnest images. Stories and studio logs are sketchy about exactly how Astral Weeks ended up sounding the way it does. A reference in the liner notes mentions the recording process taking three days, a remarkably brief period of time. But it's the details that appear even more astonishing. According to accounts, Morrison had grown weary, likely from his time with Bang Records and Them, with the studio process and producers in general. He had fallen into an ornery streak, never satisfied with the ideas being considered. There were conspicuous reasons for Morrison's uncompromising stance. In a 1970 interview with Rolling Stone's Happy Traum, Traum recounts Morrison sitting on his couch playing "Brown Eyed Girl". Traum appears impressed, making the rather innocuous comment, "it sounds more like Morrison does now." Morrison, over the course of the next few questions with Traum, discusses how his early music had been changed to sell records. A seedy side of the recording industry that made him become pugnacious about producers who "wanted a product". Morrison's volatility on the subject even served his songwriting well in later years, "Drunshambo Hustle" (Quote: "And you were puking up your guts at the standard contract you just signed") being one of many attacks against the pigeonholing pleasures of the recording industry. So rather than cross creative paths with Morrison, producer Lewis Merenstein had him enter the studio alone. Here Astral Weeks begins to become more myth than music. With Merenstein at the boards, Morrison in one session recorded an hour of music accompanied only by his guitar. He then left. Merenstein subsequently brought in session players to augment Morrison's story songs. Which means the session players never once spoke to Morrison about the music. They never played for him, with him, or around him. 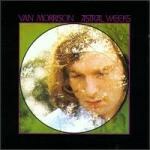 An astonishing fact when you consider the hallmark of Astral Weeks is how perfect the band "interacts" with Morrison. How they sound completely synchronized, even to a level that could be explicated via parapsychology. Of course, returning to the 1970 Rolling Stone interview, Morrison didn't entirely laud the finished product. He talks about the arrangements being too "samey" before finally offering the admission, "Though I am glad for what he [producer Merenstein] did for the songs. He did them justice." As a result of these conflicts and his own artistic ideologies, Morrison went on to produce 1970's Moondance and all of his subsequent releases thereafter. Forever turning his back on the Astral Weeks sound, for a more jump-jive blues and R&B approach. He would dabble in that feel, as on 1981's Common One, 1979's Beautiful Vision, and some of his spoken word tracks ("On Hynsford Street" from 1989's Hymns to the Silence for example), but never recaptured its lambent likeness. Because everything came together and then somehow disappeared, one could argue Astral Weeks came to life much like John Milton's exhortation at the beginning of "Paradise Lost": through the muse's effervescent mists. Morrison, for his part, seems to realize this, and thus sounds forever reluctant to strip away the mysticism. He refuses to tidy up the album's ongoing lyrical ambiguity, the centerpiece being whether or not the character in "Madame George" is a drag queen. Morrison has never entirely discredited the idea, going so far to say in his 1970 Rolling Stone interview, "It's really whatever you want it to be about. I write from some place that I don't know where it comes from at times." Reinforcing the "great man theory", to use a literary theory description, that Morrison has returned to the muse both as a source of inspiration and explanation. Which now, in my post-academic haze, reminds me of William Blake. But at any given moment it reminds me of a lot of things, a list that continues to collect literary detritus. With the alluvial bands of meaning becoming limpid personal strata as the years pass, Astral Weeks is important because it can move along a specific, personal timeline to collect such memories. The album's meaning remains socially and emotionally fluid, which ostensibly keeps it significant. Arguably must products forged from the divine, from Garcia-Lorca's duende (to reference Lester Bangs' 1978 comments), come with this built in timelessness.